More Tuneable, Better Handling. 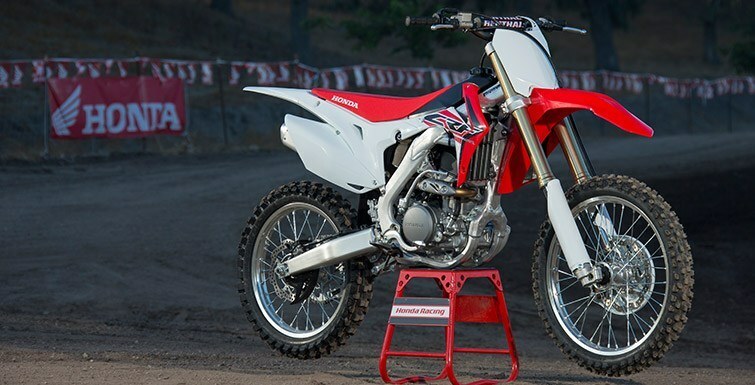 The Best 250 Out There. 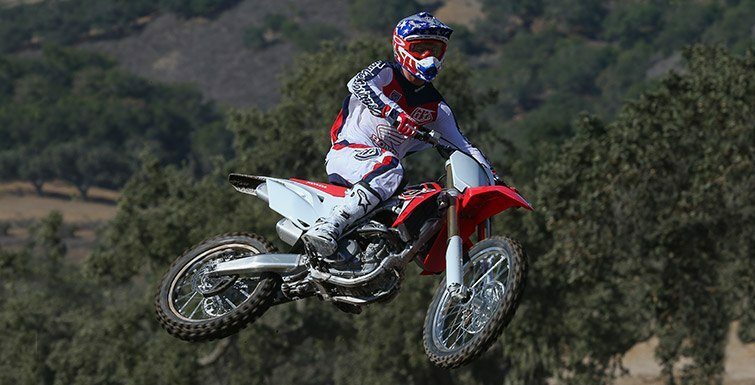 Everyone knows the Honda CRF®250R is one of the best handling bikes in the class. And for 2015 it just got a lot better, thanks to the addition of its new Showa Air Fork SFF suspension. We made plenty of other fine-tuning changes as well. One ride, and we know you’ll agree it was worth the wait. Some of the changes you’ll spot right away—the all-new Engine Mode Select button. It’s an industry first for MX bikes, and it’s going to make tuning your bike for changing track conditions a snap. Other changes include a larger front brake disc, a lighter throttle return spring and larger muffler exit-pipe diameter. 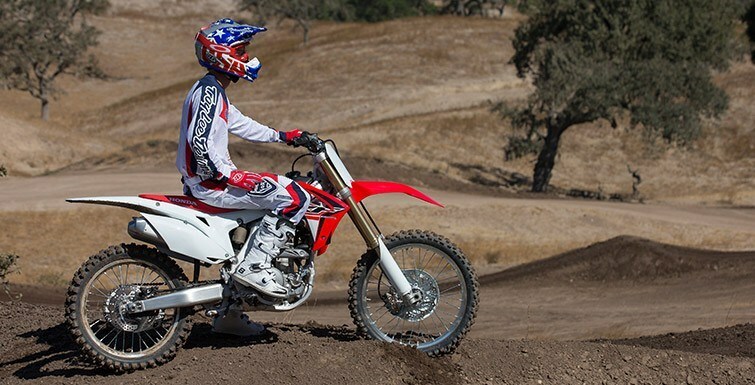 One thing’s for certain—the closer you look, and the more you ride, the more you’re going to realize that the new CRF250R is the best 250 you’ve ever wheeled up to a start gate. 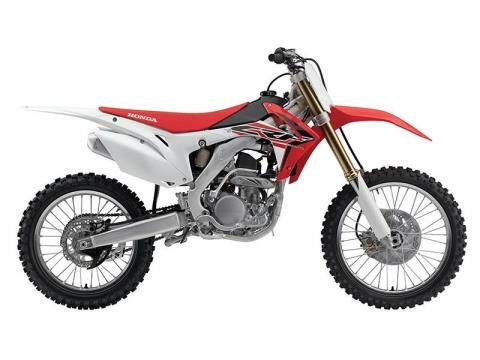 With its high-compression head, relocated exhaust power and Dual Injector fuel-injection timing, the CRF250R’s engine is specifically tuned to work with the dual exhaust to give you more low-end horsepower and more free rev up top, making this the most useable engine in the class. 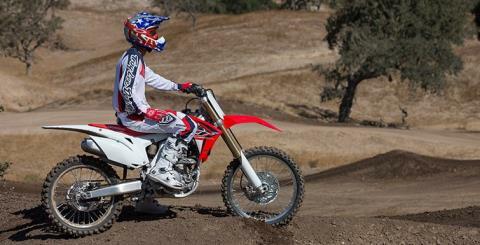 The CRF250R’s brakes have always been some of the best in the class, but they’re even better this year thanks to a larger front disc (260mm) and a new rear disc shape. New blackened radiator fin guards, rear disk guard and brake line guides look sharp and help the CRF250R stand out from the competition. 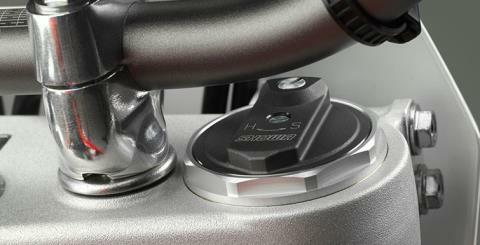 This handlebar-mounted button lets you dial in engine power delivery character with a push of your thumb. Choose between Standard, Smooth and Aggressive, depending on track conditions. 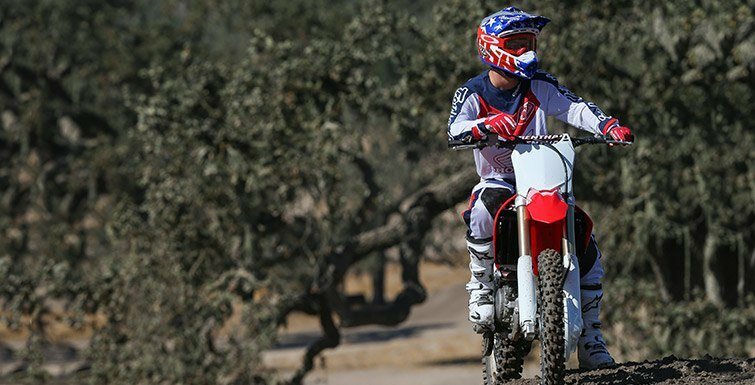 Developed using Dunlop’s “block-on-block” technology, the unidirection MX52F front tire and MX52 rear tire give excellent feedback and traction, and are a perfect complement for the CRF250R’s new suspension. 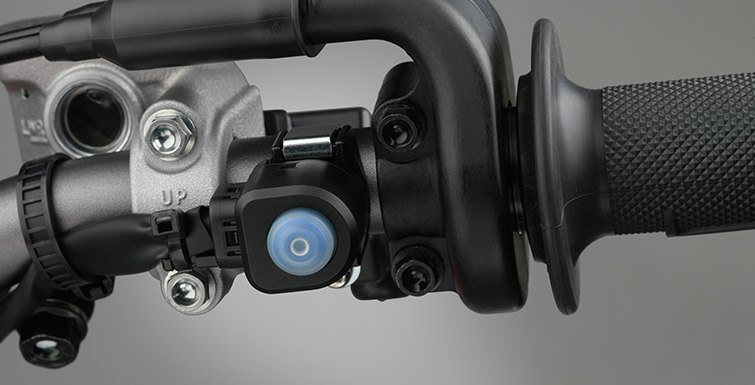 Huge news for 2015, this simple handlebar-mounted button lets you dial in engine power delivery character with a push of your thumb. Choose between Standard, Smooth and Aggressive, depending on track conditions. If you want to change up the settings, you can reprogram the Smooth and Aggressive modes with our optional HRC Tuning Tool for a custom-tailored power delivery. A full 260mm in diameter this year (up to 240mm) and featuring a revised wave profile for lighter weight, the CRF250R’s front disc offers excellent stopping power and also superior lever feel. 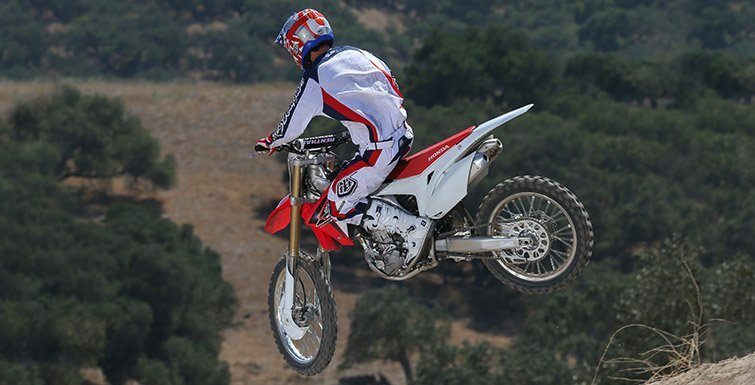 The CRF250R’s twin-muffler setup lets our engineers move the mufflers towards the bike’s center of mass. That also lets us move their mounting points so the subframe can be lighter—and that means improved handling characteristics. The CRF250R’s engine revs fast, and a lighter throttle return spring lets you take advantage of that. At the end of a moto it’s a big deal. 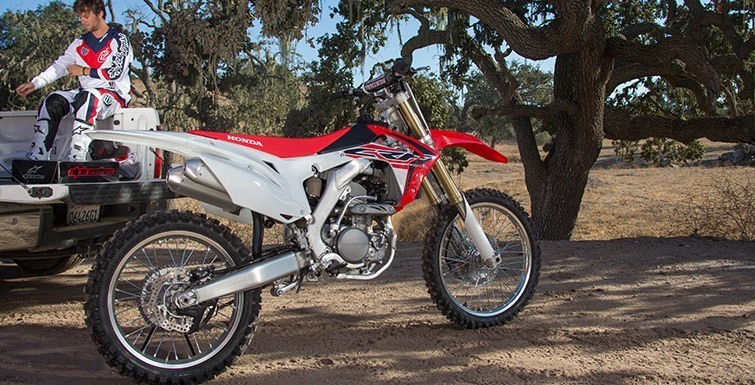 Along with its other tuning changes, since the CRF250R’s muffler-outlet pipes that are bigger in diameter this year, you’ll notice a boost in low-end torque feel. 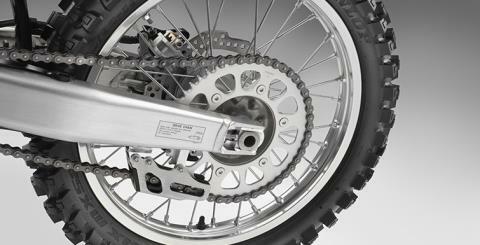 The wave-rotor shape of the CRF250R’s rear disc looks sharp, shaves weight, and collects less debris. The all-new 49mm inverted Showa SFF (Separate Functioning Fork) air fork weighs less than a conventional-spring design, it’s easier to adjust, and it helps keep the front end planted. 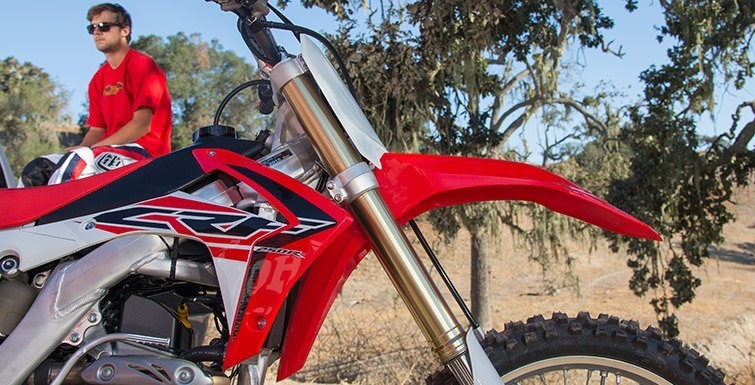 Lighter and easier to tune than a conventional-spring fork, the CRF250R’s new Showa® SFF air fork improves suspension reaction and simplifies adjustments for track conditions. The CRF250R’s twin-spar aluminum chassis features lower frame spars to help lower the center of gravity and improve center of mass. The result? A machine that’s both responsive and stable, and that’s easier than ever to rail around the next berm. The revised settings on the CRF250R’s Programmed Fuel Injection help deliver smooth, predictable engine performance. And with our available HRC Fuel Injection Setting Tool, it’s easily adjustable to specific track conditions and you can refine your own settings in place of the smooth and aggressive settings on the engine mode selector. Like our CRF450R, the new CRF250R uses an exclusive twin-muffler design. 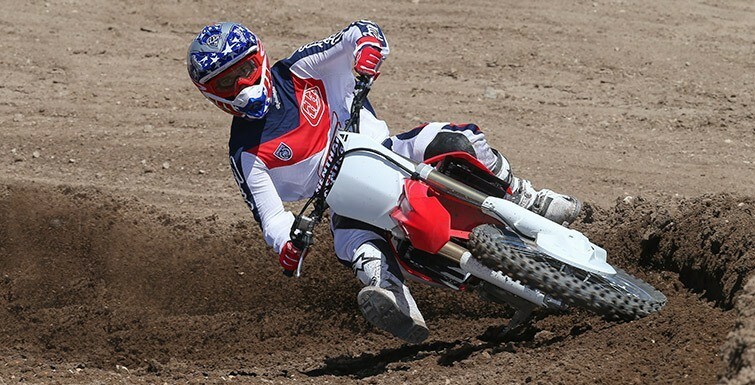 Compared to a traditional single-muffler setup, the CRF250R’s mufflers are shorter and lower, tucking in closer to the bike’s center of mass. 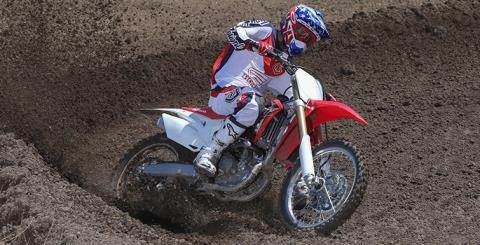 That helps make the CRF250R a better handling machine. And for 2015 the mufflers’ outlet pipes are bigger, contributing to the bike’s improved power. New for 2015, a larger-diameter exit pipe means more power. 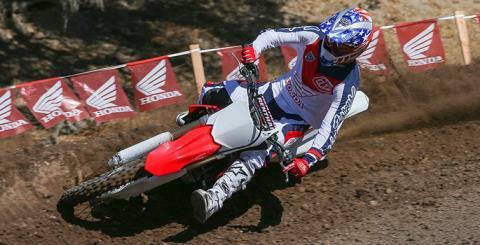 The CRF250R’s mufflers are shorter, lower and tucked in much closer to the bike’s center of mass.